Krzanich's clean sweep claims a victim. Intel has launched a new series of processor logos alongside a five-star rating system designed to help end users compare different chips. 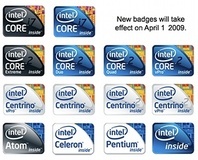 Leaked pictures show that the Core i7, Core 2 and Centrino brands could soon be getting shorter, wider logos. Intel has officially launched the latest version of its mobile platform, Centrino 2 - previously codenamed Montevina - and there are some impressive new features included. Here's a handy index of our comprehensive coverage of the Spring 2008 Intel Developer Forum from Shanghai, China. IDF FALL 07: Intel has said that mobility is now mainstream and shipments are on schedule to overtake desktop shipments in 2009. MSI's GX600 notebook has got a turbo button and funky case design - but is it what you really wanted? Today sees the launch of Intel's next-generation Centrino platform, which was codenamed Santa Rosa. 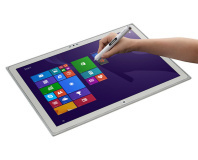 It brings a whole host of new features to notebooks, including Draft 802.11n wireless and Turbo Memory. We have a look at some of the new features and also cover Nvidia's new discrete mobile GeForce 8M-series GPUs too. IDF SPRING 2007: Intel technical Guru, Mooly Eden, tells all in the tales of next generation mobile computing. IDF FALL 06: We hear all about Intel's vision of a connected mobile lifestyle. This means 3G, ClearVideo and the meaning of life. IDF SPRING 06: The next generation of Intel's Centrino technology is called Santa Rosa, and it sports a host of improvements. Don is the man behind Intel's leading brand, Centrino, and its new digital home initiative - Viiv. 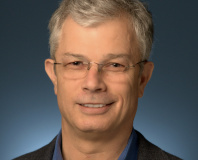 We sat down to talk to the man that wants an Intel chip (or two) in every living room, covering topics including DRM and Linux. Looking for gaming performance in a portable form-factor? We put Alienware's Area-51 m5700 Centrino notebook through its paces. Is a GeForce Go 6800 really 'too slow' these days? The latest gaming notebook from Rock sports a 7800 GTX graphics chip, a Pentium M processor as well as a gorgeous 17" screen. It's also overclockable! We find out if this is truly the nicest enthusiast gaming notebook on the planet. Shuttle's first Pentium M effort is a complete stunner. An external PSU, near-silent design, great looks, some overclockability and decent performance to boot. Is this the ultimate SFF? IDF FALL 05: Intel's new Centrino platform will support Matrix RAID. Can you say 'Ultimate LAN notebook'? IDF FALL 05: Intel's got new processors coming. They are planning to change their entire desktop and notebooks line to chips based on the same microarchitecture, delivering better performance per watt of power. Could this be Intel's comback kid?